Have you ever experienced having a flat tire on the middle of the road? After a few minutes, you realize that there are no nearby gasoline stations around, no air compressor, and basically no one to help you. What are you going to do? To avoid this horrible experience, you should have a portable air tank! Yes, Husky now offers an air tank that you can bring with you anywhere you go. 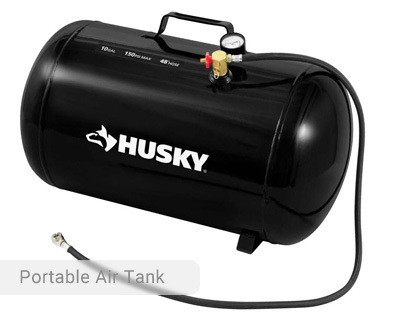 Husky Portable Air Tank 10 Gallon is your alternative solution if your air compressor is too big and heavy to be put inside your car’s compartment. 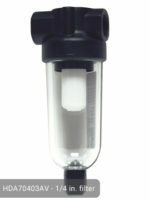 The air tank is fully assembled so you can use it immediately once you purchase it. No need to worry about installation or wiring and other similar stuff. The 10-gallon capacity provides a huge storage of air that will keep your tires running even at great distances. It can provide a maximum of 150 psi of air pressure which is more than enough to perform your inflation tasks. It can blow up your tires in a few minutes. The tank features a 48-inch hose which makes it more convenient to reach certain difficult areas. 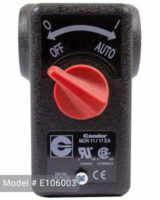 It has a pressure gauge so you can regulate and monitor the amount of pressure that it delivers. It is very reliable and gives accurate readings. Because it was designed to be portable, it has a very durable handle that can give you a good grip of the portable air tank. The brass manifold is of high quality so expect that the pipes will not be easily clogged. Aside from tire inflation, it can also do blow cleaning and recreational inflation applications. The tank has a horizontal orientation. It is made of steel and is certified to be safe. It is a bit bulky but you can still easily squeeze it in your car for remote inflation tasks. It does not have wheels but you can carry it around using the welded handle. It only weighs 31 lbs. so even your son or daughter can transport it from one place to another. You can also add attachments to the air tank to power pneumatic tools such as a hand blow gun to spray things off. As long as you have the appropriate hose and a quick disconnect, you can power spray guns, air drills, and sand blaster. 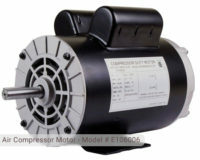 However, the run time is limited as compared to when you are using an air compressor. It is recommended that you use the air tank for tires which might be a little low but are not very low to ensure that they will be completely filled. It has proven to fill four full-sized car tires. However, it cannot fill your paintball tank because of its limited maximum pressure. Another great feature is that the tank can be filled even if the output is off. This is a big deal for people who don’t have the luxury of time. Husky 10-Gal. Portable Air Tank has twice the capacity for the same price. It only costs about $34.99. If you have Husky air compressor that has a small capacity, you can use this air tank to add to that. The next time you experience a flat tire, you will not feel the excruciating fear and panic because you already have your rescuer in the form of Husky portable air tank. Many people still don’t know how to fill portable air tank. And if you experience the same problems then this section is for you. The steps in filling an air tank are pretty simple and straightforward. Just take your tank to any source of clean and compressed air. Surely, there are a lot of full service gas stations or truck stops within your locality. These are reliable sources of compressed air. Attach the air hose from the service station or low pressure air compressor to the air fitting of the manifold of your air tank. When the hose is properly fitted, begin pumping the air. Monitor the pressure gauge as you are pumping so as not to overfill the tank. Husky Portable Air Tank CT10H has a very accessible pressure gauge for your convenience. Just like any other tool, there are safety measures that need to be practiced when using an air tank. First, Husky 10-Gal Portable Air Tank is only compatible with compressed air. Do not fill it with anything other than air. When filling the tank, do not over-pressurize. As much as possible, only fill it with air from a low air compressor or from a service station. The tank can only store so much. 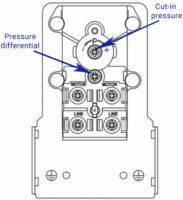 The pressure gauge is there to assist you in monitoring the level of air pressure. When using the tank for inflation purposes, do not over-inflate. Do not exceed the maximum rating of any inflatable to avoid damage and for your own safety. Check the pressure frequently during inflation. To determine the maximum pressure that the inflatable can handle, read the manual. Drain the tank regularly of water condensation which may have developed already. This condensation can develop because compressed air creates moisture that can build up over time. This can corrode the materials of the tank and eventually damage it. Just hold the tank upside down and remove the bypass valve spring to drain. Husky 10-Gal. Portable Air Tank has a safety pressure bypass valve. Pull this one prior to operation to ensure that the valve is functioning properly and that there are no obstructions in it. Upon noticing that there is a leak, you should discard it immediately. It is very difficult to repair a damaged air tank. Even if it gets repaired, you are not assured and guaranteed of its quality anymore. It is always better to be safe than sorry. Store the air tank in a dry place so as not to damage its elements. If you are going to transport it elsewhere, make sure that it is not exposed to extreme heat or moisture. Use it for its intended purposes only and never play with it.